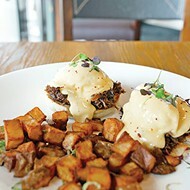 Sunday brunch service allows Ludivine diners to keep up with menu favorites. The avocado toast is a new item with maple bacon, cherry tomato and white truffle oil. With a commitment to farm-fresh ingredients, the Ludivine dinner menu is famous for changing by the day, but the debut of its Sunday brunch menu allows diners to pick favorites around a set selection of entrees with slight seasonal tweaks. 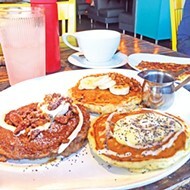 Chef Russ Johnson said the restaurant has received many requests for brunch since opening in 2010, but logistically, they never felt Ludivine could pull it off until last year. 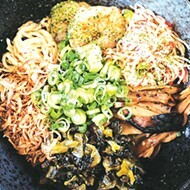 Ludivine doesn’t staff the kitchen with different people in the same position, so after a late-night Saturday dinner, the staff turns around Sunday morning for the 11 a.m.-2 p.m. service at its 805 N. Hudson Ave. location. Johnson decided to start in the spring last year when fresh produce begins to roll into the kitchen and the restaurant is far removed from the winter holiday busy season. The new brunch menu features a few popular holdovers from last year’s menu like the croque tartine Parisienne ($18), an open-faced version of the popular sandwich that substitutes the ubiquitous Swiss cheese for emmenthal and raclette cheeses. Ludivine’s version of a lox Benedict ($18) tops an “everything” spiced bread pudding with house-cured salmon, poached eggs, cream cheese fondue and red onion dill caper relish as a returning item from last year’s menu. 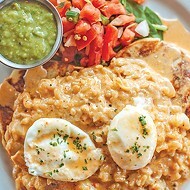 It also offers a chicken-fried steak Benedict ($15) on buttermilk biscuits with poached eggs and cream gravy. Johnson said that one of the most beloved items last year was green chili pork tamale, which has found new life as sopes ($16). 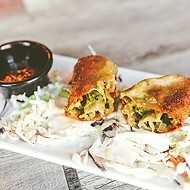 A crispy masa cake is topped with black bean refritos and filled with pork green chili and a farm egg and Cotija cheese. The dish of lobster and grits ($28) is an example of how the main components will stay the same, but the dish’s accoutrements will change depending on the season and availability of products. As it is currently constructed, the butter-poached lobster tail tops popcorn grits and is paired with a salad of garlic scapes, cherry tomato, sweet pepper and jicama. Brioche French toast or a crispy sweet waffle ($10) can be topped with Stillwell strawberries (additional $4) or even decadent foie gras ($12). Avocado toast ($12) combines maple-glazed bacon, cherry tomato and white truffle oil, and a horchata ricotta toast with grilled strawberries. “I might take the horchata ricotta [toast] off the menu because it hasn’t been super popular, but everyone is familiar with avocado toast, so it is going well,” Johnson said. Ludivine’s offering of a steak tenderloin ($24) served over a Parmesan potato cake and topped with chimichurri and eggs follows the introduction of beef to its dinner menu. 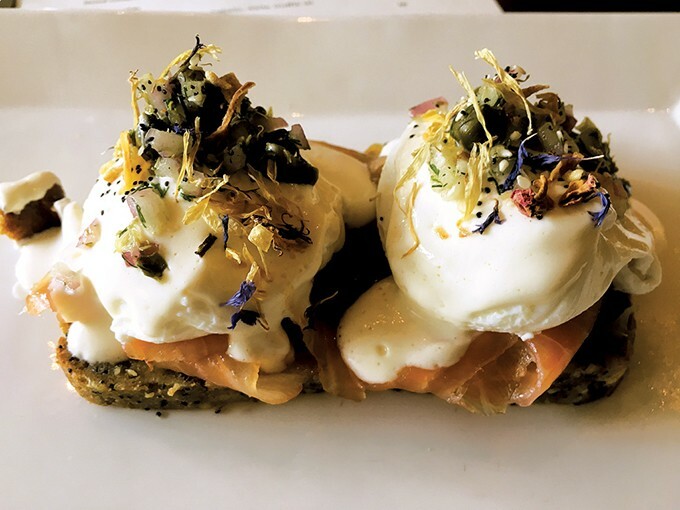 Ludivine’s lox Benedict returns to its brunch menu with an “evertyhing” bread pudding topped with house-cured salmon, poached eggs, cream cheese fondue and red onion dill caper relish. “We didn’t used to have steak,” Johnson said, admitting that he first wanted the restaurant to focus on proteins not normally seen on area restaurant menus like goat, duck and rabbit. Eventually, Johnson brought in Wagyu beef from Ironhorse Ranch in Macomb. “We like to use off-cuts like sirloin flap and chuck flap, these lesser cuts, but because the beef is so good, we serve sirloin that people routinely say is the best they’ve ever had,” Johnson said. The dinner menu at Ludivine features two constants: bone marrow from beef femurs that have been cut in half and roasted and a charcuterie board. The bone marrow is served with toast, grain mustard, pickled shallots and onion marmalade. Guests have the option of adding a “bone luge,” a shot half of sherry and half rye whiskey. “Once you’ve eaten the marrow, pour the shot down the [hallow bone], and it collects the last bits of beef; it is very popular and fun,” Johnson said. The dinner menu also features four entrees: steak, seafood sourced from the company Sea to Table that gets fish from sustainable fishers, a braised meat and either a pasta dish or vegetarian dish. Though Ludivine is heavy on meat proteins, Johnson stressed that the kitchen is always able to accommodate vegetarian or vegan guests with a special entrée. Johnson graduated from college in 2003 in Colorado and got a job working at Z Cuisine in Denver in 2005, which was named to multiple top-restaurant -in-the-country lists before it closed in 2016. It’s the first place Johnson worked where the head chef placed an onus on working with local ingredients from the farmers market and other producers. He took the philosophy with him when he returned home to Oklahoma City in 2008, eventually opening Ludivine and The R&J Lounge and Supper Club with chef Jonathon Stranger, who left in 2016 to pursue other opportunities. Johnson and Ludivine staff work closely with produce brokers, who bring in produce and goods from small farms around the state that aren’t able to make it to the farmers market. 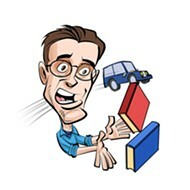 Often, that means driving to farms themselves.